Although the individual female depicted in the photograph is unknown, there are several potential candidates for who it may be. The first and most likely candidate, in my opinion, would be James Muir's first wife Elizabeth nee Coutts. 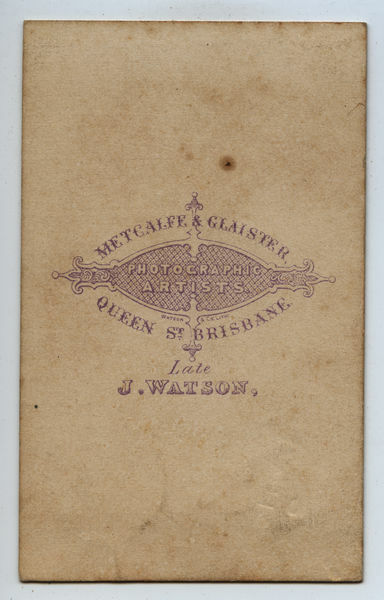 As identified in the post titled Trove Tuesday : The family of James Muir, James and Elizabeth were married 15 December 1874, the year prior to when this photograph is believed to have been taken (based on the rear imprint information - see below). Combine this information with the previously identified photo of James Muir by Metcalfe & Glaister [Carte de visite], which was taken by the same photographers around the same time period. 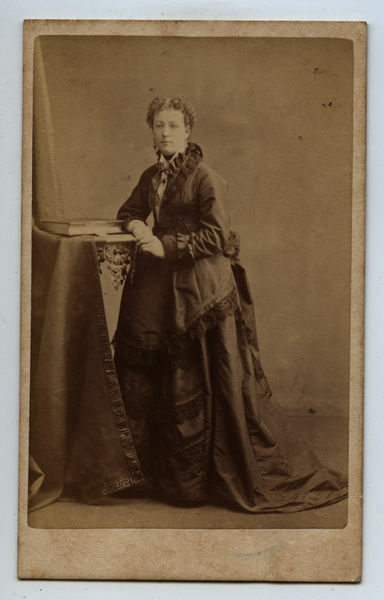 It is also known that Georgina Auld nee Muir & James Muir's sister, Christina Muir, was also living in Brisbane, although to date it is not known when Christina arrived in Australia.